Blood pressure is a measure of how well our cardiovascular system is functioning. We all require a blood pressure high enough to give our organs the blood and nutrients they need, but not so high our blood vessels become damaged. As such, our bodies must maintain control over our blood pressure to keep it at a normal level. In this article, we will consider the short term and long term control of blood pressure, as well as some of the problems when control of blood pressure is lost. The body’s blood pressure is a measure of the pressures within the cardiovascular system during the pumping cycle of the heart. It is influenced by a vast number of variables, and can alter in either direction for various reasons. Everyone’s blood pressure is slightly different and can change throughout the day depending on activity. There is a range of normal blood pressures that we consider as acceptable. When blood pressure is outside of this normal range of values, people can start to have problems in both the long and short term. Our body tries to maintain a stable blood pressure in the process of homeostasis. Systolic pressure – the first number (120 mmHg in the example) is the pressure of the blood during the heart contraction. Diastolic pressure – the second number (80 mmHg in the example) is the pressure of the blood after one contraction but before the next contraction. Fig 1 – A sphygmomanometer and stethoscope being used to measure blood pressure. Short-term regulation of blood pressure is controlled by the autonomic nervous system. Changes in blood pressure are detected by baroreceptors. These are located in the arch of the aorta and the carotid sinus. Increased arterial pressure stretches the wall of the blood vessel, triggering the baroreceptors. These baroreceptors then feedback to the autonomic nervous system. The ANS then acts to reduce the heart rate and cardiac contractility via the efferent parasympathetic fibres (vagus nerve) thus reducing blood pressure. Decreased arterial pressure is detected by baroreceptors, which then trigger a sympathetic response. This stimulates an increase in heart rate and cardiac contractility leading to an increased blood pressure. 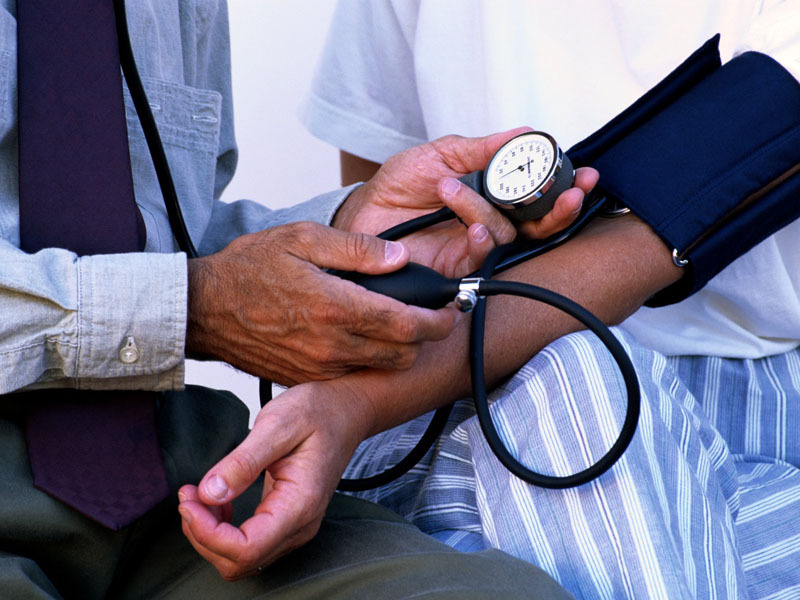 Baroreceptors cannot regulate blood pressure long-term. This is because the mechanism of triggering baroreceptors resets itself once a more adequate blood pressure is restored. There are several physiological mechanisms that regulate blood pressure in the long-term, the first of which is the renin-angiotensin-aldosterone system (RAAS). Renin facilitates the conversion of angiotensinogen to angiotensin I which is then converted to angiotensin II using angiotensin-converting enzyme (ACE). Angiotensin II is a potent vasoconstrictor. It acts directly on the kidney to increase sodium reabsorption in the proximal convoluted tubule. Sodium is reabsorbed via the sodium-hydrogen exchanger. Angiotensin II also promotes release of aldosterone. ACE also breaks down a substance called bradykinin which is a potent vasodilator. Therefore, the breakdown of bradykinin potentiates the overall constricting effect. Aldosterone promotes salt and water retention by acting at the distal convoluted tubule to increase expression of epithelial sodium channels. Furthermore, aldosterone increases the activity of the basolateral sodium-potassium ATP-ase, thus increasing the electrochemical gradient for movement of sodium ions. More sodium collects in the kidney tissue and water then follows by osmosis. This results in decreased water excretion and therefore increased blood volume and thus blood pressure. The second mechanism by which blood pressure is regulated is release of Anti Diuretic Hormone (ADH) from the OVLT of the hypothalamus in response to thirst or an increased plasma osmolarity. ADH acts to increase the permeability of the collecting duct to water by inserting aquaporin channels (AQP2) into the apical membrane. It also stimulates sodium reabsorption from the thick ascending limb of the loop of Henle. This increases water reabsorption thus increasing plasma volume and decreasing osmolarity. Atrial natriuretic peptide (ANP) is synthesised and stored in cardiac myocytes. It is released when the atria are stretched, indicating of high blood pressure. ANP acts to promote sodium excretion. It dilates the afferent arteriole of the glomerulus, increasing blood flow (GFR). Moreover, ANP inhibits sodium reabsorption along the nephron. Conversely, ANP secretion is low when blood pressure is low. Prostaglandins act as local vasodilators to increase GFR and reduce sodium reabsorption. They also act to prevent excessive vasoconstriction triggered by the sympathetic nervous and renin-angiotensin-aldosterone systems. Hypertension is defined as a sustained increase in blood pressure. It may be primary (of an unknown cause) or secondary to another condition such as chronic renal disease or Cushing’s syndrome. Hypertension causes damage to the walls of blood vessels, making them weaker. This leads to a number of pathologies including atherosclerosis, thromboembolism (progressing to MI or stroke) and aneurysms. Hypertension also damages the heart itself by increasing the afterload of the heart. The heart is pumping against greater resistance, leading to left ventricular hypertrophy. This increases the risk of heart failure in the future. Hypertrophy of the cardiac muscle also increases the heart’s oxygen demand, predisposing to myocardial ischaemia and ultimately angina. First-line pharmacological therapies include ACE-inhibitors/angiotensin receptor blockers (ARBs), calcium channel blockers and diuretics. Lifestyle advice includes reduction of salt intake, reduced alcohol consumption, stopping smoking, regular exercise and reduced intake of saturated fat. What is blood pressure a measure of? Select the single best answer. Which of these statements is the most correct? Considering average blood pressure of a healthy individual is 120mmHg/80mmHg, what does the 80mmHg represent? Which of these components are not involved in the short-term regulation of blood pressure? Which of these components are not involved in the long-term regulation of blood pressure?